"I'm just out in The Yard. " What other boat name could describe our coastal lifestyle so accurately? Spend every minute of your leisure time in WA's offshore back yard on your beautifully appointed 2008 Maritimo M52. The Maritimo 52 is truly a perfect "all rounder" for those seeking something luxurious and extremely capable offshore. Roomy enough to accommodate an adult family and friends, but under the 16m threshold for Blue Disc Moorings at Rottnest. The signature Maritimo 3 x 2 layout proves itself in this vessel with a large master suite to port including a comfortably sized en suite. The forward VIP cabin has a walkaround double bed and access to the day head to starboard. Further guest accommodation includes the 2 single bunks in the third cabin, a convertible lounge in the flybridge and the saloon dinette. 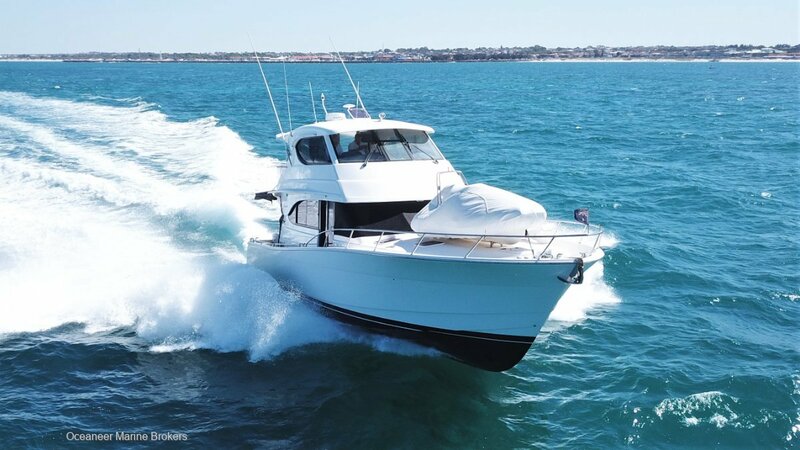 Optioned with the excellent CAT C12 700hp engines coupled with ZF gearboxes and two helm stations, this M52 has a comfortable cruise speed at 24 knots. Opened up she will reach over 30 knots at sprint with ease. The 3800L fuel capacity gives her an impressive cruising range, this will be of most interest to buyers looking to spend long periods of time cruising the coast in Eagle Bay, the Abrolhos or further north to the Kimberleys. "The Yard" has also recently been afforded a comprehensive electronics upgrade, with dual Garmin GPSMAP touch screens displaying the CCTV cameras, plotter, sounder and radar. It is evident that from new this vessel has been boatman maintained, and consistently serviced as required. A full custom linen and bedspread package has just been fitted, which makes an impressive impact on the interior design of the vessel. This model is the 61st out of the Gold Coast based factory, over 3 years from initial launch of the 52, this 2008 model benefits from all the modern improvements attributed to a long production run. Oceaneer Marine is Perth's trusted Maritimo consultant and liaise directly with the factory on your behalf for any maintenance or upgrade enquiries. accomodationMaster cabin with queen bed and en suite, forward VIP cabin double bed with day head access, starboard bunk cabin, convertible double sofa in fly bridge, dinette lounge in saloon.